OREM, Utah, Nov. 14, 2017 (Gephardt Daily) — A Provo resident and two men from Arizona are in the Utah County Jail after they were arrested for possessing 16 pounds of methamphetamine. Nathan Karner, 32, Provo, Adolfo Parra, 23, of Avondale-Goodyear, Ariz., and Jorge Almonte, 20, of Phoenix, were seen to be engaged in “suspicious activity” by Orem Police Detectives on Nov. 9, according to a probable cause statement. Two men, later identified as Parra and Almonte, were seen at a bus stop carrying a large black duffel bag. They were then seen getting into a white Dodge bearing a licence plate that connected it with previous illegal narcotic activity. The vehicle turned south, onto State Street near Center Street, and officers initiated a traffic stop. The driver, identified as Karner, was known to have previous involvement with drugs, and had no driver license in his possession, failed to signal his turn, and had no insurance on the vehicle, the statement says. Officers requested a K-9 to sniff for narcotics, and it indicated it found them in the black duffel bag in the back seat. The bag contained 16.768 pounds of methamphetamine packed into plastic containers of about one pound each. A scale was found in the car’s middle console, the statement says. After waiving their Miranda rights, Karner said he knew nothing about the methamphetamine, and he was ” … just asked by a friend of a friend to come and pick up two people which he had never met before,” according to the probable cause statement. Parra said he knew his cousin, Almonte, was dealing drugs, “but did not think he would be brought into the mix,” the probable cause statement says. “Adolfo stated he was invited by his cousin Jorge to come to Utah. Adolfo stated he did not know the methamphetamine was in the duffel bag until Jorge started acting funny when they arrived in Orem. Almonte told police he and his cousin left Arizona in search of snow so they could snowboard, the probable cause statement says. Almonte then requested a lawyer, and all three men stopped talking, the statement says. 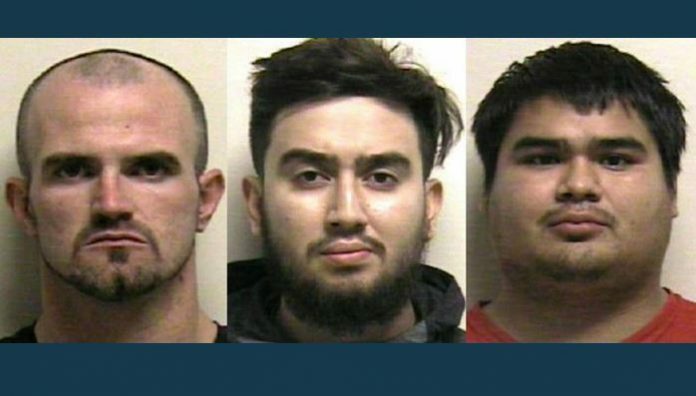 “All three males were taken into custody and transported to the Utah County Jail with multiple felony charges,” the statement says. “It is upon request of the Officer that all three males be held without possibility of bail.